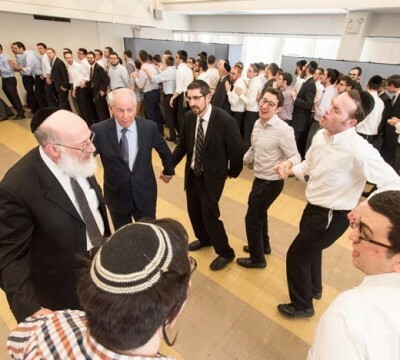 The group of ten students from Yeshiva University High School for Boys/Marsha Stern Talmudical Academy (YUHSB) knew, as soon as they arrived at Israel’s Ben Gurion International Airport, that things would be very different. Yeshiva University received an Eddy Award from “Pensions & Investments,” an international newspaper that focuses on money management, at the newspaper’s 17th annual Defined Contribution Conference in Miami Beach, Fla., on February 9. The Eddy Awards recognize the highest caliber investment education programs of defined contribution plan sponsors — corporate, union and not-for-profit — and service providers. Yeshiva University men’s basketball junior Martin Leibovich, a native of Buenos Aires, Argentina, has earned four major weekly awards after an outstanding week of play during which the guard/forward led the Maccabees to a 1-1 record. How do today’s busy Jewish professionals—raising families and keeping up with daily activities—face the challenges of incorporating learning Torah into their lives? How does one keep one’s faith vibrant in our not-a-moment-to-spare society? Freshman orientation is fast approaching, yet that intense time of adjustment does not apply to fresh-faced teens alone. It also extends to new college presidents.